[Registration Closed] Application Information Session:“Health Policy Academy: The 8th Session of Health Policy 101” (February 4, 2019) - Health and Global Policy Institue（HGPI） The global health policy think tank. *Please note that this session is available only in Japanese. Therefore, please visit the Japanese website for the details. 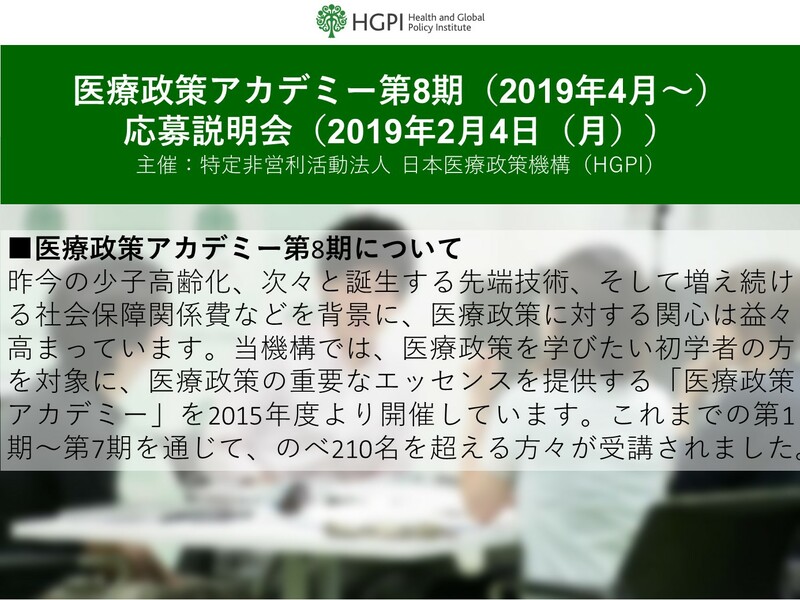 The Health Policy Academy, which now has up to over 210 graduates and its 8th session will start in April 2019 as Health Policy 101. There will be an application information session for all lecture attendees prior to the official registration. During this session, we will provide an overview of Health Policy 101 as well as introduce a short version of the lecture. In addition, we will upload a recording of the session later on our website. *Participation of this info session is not mandatory and will not affect your chance of attending Health Policy 101.